Norwegian films have never been more successful abroad. The total export value of the Norwegian films released in 2015 is estimated to be NOK 87.3 million. This is NOK 18.1 million more than the 2014 films, which is the highest number presented in this survey uptil now, and equals an increase of just above 26 percent. Increasing export of Norwegian audiovisual products has been a long-standing political goal. The white paper (St.meld. Nr 30, 2014-2015) Ein framtidsretta filmpolitikk (A Film Policy for the Future) emphasised the importance of having a foreign market to increase the revenue potential of the film industry and help strengthen its industry. The Ministry of Trade, Industry and Fisheries and the Ministry of Culture have therefore established a council with the aim of strengthening cultural and creative industries and helping increase turnover and exports, as outlined in the 2017 budget proposition from the Ministry of Culture. The purpose of the export survey is to follow the development of foreign sales of Norwegian theatrically released films and to examine whether this development corresponds to the policy goals. 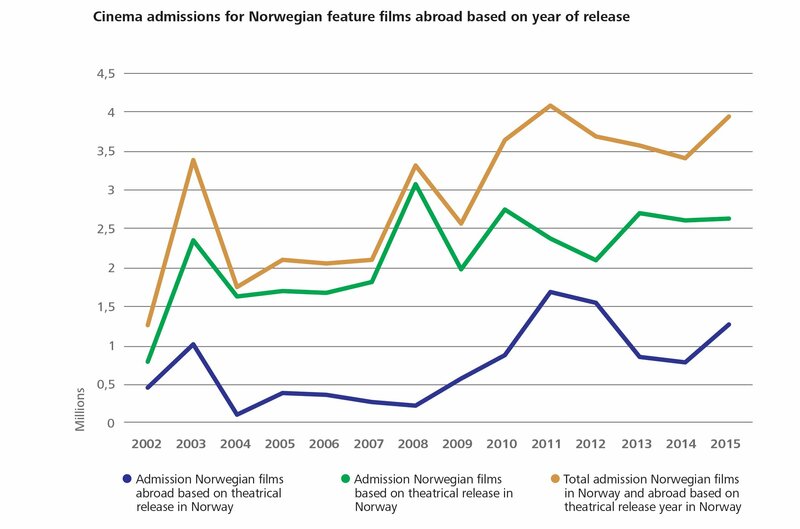 Since 2005 the Norwegian Film Institute (NFI) has carried out surveys of the export of Norwegian theatrically-released films. The first survey covers the years from 2002 to 2004, and similar surveys have been completed each year ever since. As such, they form a historical series from the calendar year of 2002. The 2017 export survey, which maps out the export value of the 2015 Norwegian theatrically released films, was carried out in the period of August to November 2017. The survey covers 23 Norwegian films with theatrical release between the 1 of January and 31 of December 2015. These films included five documentaries and five children's films. 18 of the 23 films were sold abroad. The total value of the 2015 Norwegian film export is estimated to NOK 87.3 million. This is NOK 18.1 million more than the 2014 films, which was the highest number presented in this survey up until now, and equals an increase of just above 26 percent. Out of the NOK 87.3 million, 63.6 million (73 percent) is pre-sales in various forms, while the sales of the completed films constitute 23.7 million (27 percent). The three most successful 2015 films, had a total export value of NOK 67.3 million abroad. This is a major increase from 2014, where the three top films’ export value was NOK 38.2 million. The market for foreign sales is unstable and marked by great volatility. The audience potential of the individual films has a lot to say for the total export value of Norwegian films for the individual year. 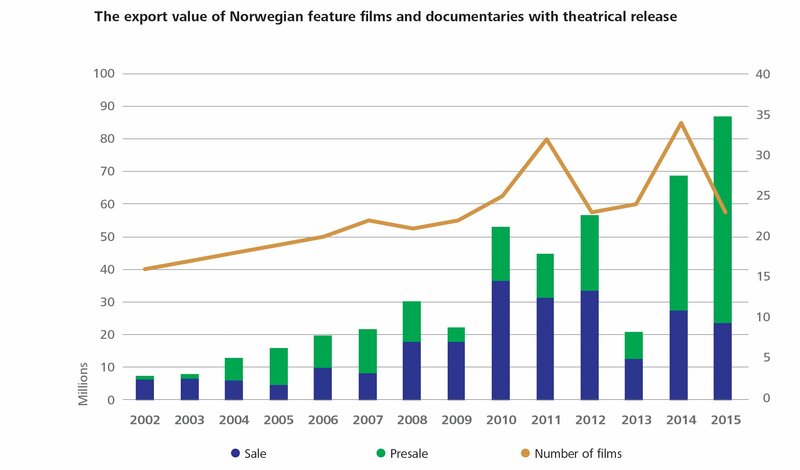 The below figure indicates the export value of the Norwegian films in regular theatrical release from 2002 to 2015. The export value indicates foreign revenues (monetary export value), but can however also be used as an indicator of availability and admissions internationally (cultural export value). When a film is sold, the usual intention is to release it for an audience on one or more platforms. It is also reasonable to assume that the higher the cost, the larger the audience. The total export value of the 23 Norwegian films theatrically released in 2015 is estimated to be NOK 87.3 million. The export value registered for the 2015 films is thus NOK 18 million higher than for the 2014 films, which in turn was 12 million higher than the previous top year of 2012. This constitutes an increase of 26 percent from the previous year. 18 of the 23 films released in 2015 were sold abroad. The three films with the highest export value sold for NOK 67.3 million. So it is reasonable to say that the growth in total export value is due to a small number of films having sold very well. It is generally important to be aware of that with a relatively small selection of films each year, the export value is sensitive to random variations from year to year. The NFI export survey only measures the value of theatrically released films (feature films and documentaries). Several Norwegian drama series and documentaries enjoy great success abroad and yield a high export value. This is not reflected in the survey, however. In order to measure admissions abroad, we are using figures from the European Audiovisual Observatory database, Lumière Pro. Here statistics from all European markets are collected, as well as from twelve other national markets. These figures are updated with some latency, and it is therefore not advisable to look at statistics for the foregoing year. The below figure shows the development in admissions from 2002 up to 2015. Looking at admission figures from 2015 and 2016, Mexico is the foreign country with the largest audience for Norwegian films. This is primarily due to the fact that Bølgen / The Wave sold more than half a million tickets, and the film also had high admissions in several other Latin-American countries. Louder Than Bombs did well in France and Mexico: both countries had admission figures double the Norwegian numbers. Among other films with a prominent admission share were A Thousand Times Good Night, Welcome to Norway, and children's films like Kaptein Sabeltann / Captain Sabertooth, Doktor Proktor / Doctor Proctor, and Solan og Ludvig / Louis & Luca (which are actually featured in two of the most-watched films). On the list of the ten countries with the highest admission figures, we find a mixture of countries where Norwegian films traditionally find a welcoming audience (Germany, France, The Netherlands, Poland) and some countries where the figures to a larger extent are caused by individual films doing very well (Mexico, Colombia, Venezuela), however none of our closest neighbouring countries. Here, the countries are just ordered by the total number of tickets sold, not adjusted for population size. If we do that, Denmark jumps right to the top with seven tickets per 1000 inhabitant, but otherwise little is changed: France, Mexico, Germany, Poland and the Netherlands are still at the top with about five tickets per 1000 inhabitant.